I was born in New York City in 1976. After living in Poughkeepsie, NY and Richmond, VA, I moved back to NYC in 1994 and stayed there until August of 2011. I currently live in St. Louis, MO with my wife and dog, and am working toward my Masters in Communication Arts while I continue to sell my eBook and paperback "Excelsior" and rewrite my 2002 novel "From Parts Unknown." 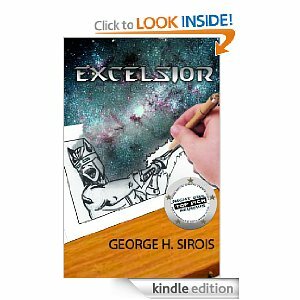 Excelsior is a science-fiction young adult novel that was finished in 2010. The main character was created in 1992 as part of a universe that was first developed in 1985 with several friends in grade school. I wanted to not only tell the definitive origin story for a character I created in 1992, but I also wanted to use the other half of the main character as a tribute to my cousin Matthew Henkel. Matt died in 2005 just before his 25th birthday, and I wanted to put him in a position where my own personal hero got to save two different planets. Readers can expect a new spin on a familiar type of tale. When I grew up, I found myself attracted to a lot of different stories in film, television and books that were modeled after Campbell's "Hero's Journey" template. So this was my chance to tell the kind of story that I grew up loving, the kind of story that we don't see very much of without a heaping dose of cynicism attached to it. I was 9 years old when I started developing this universe of mine with friends. Mainly science-fiction, but I'm getting into writing young adult and I've also written a little bit of comedy. I do think so, yes. The quickest way to get bored is to keep telling the same types of stories. From the movies I grew up watching. They gave me such a thrill that I wanted to give that same kind of feeling to younger readers. I'd have to say George Lucas. The man took so many elements from his childhood and re-invented it and created his own wonderful universe. Rewriting my 2002 novel "From Parts Unknown"
Seeing "Excelsior" connect with so many readers. The reviews I've gotten back so far for it have been wonderfully encouraging. I get in my own way all the time. With the exception of writing my first draft of "Excelsior" in only 30 days, it's very difficult for me to get into the groove of writing every single day. How did you overcome these setbacks? I push myself through it, and a big part of it is writing at a coffee shop. If I'm writing in public, for some reason, it seems to loosen me up and push me to create more. Don't be afraid to write crap. Writing is rewriting and you can't rewrite from nothing. More of a plotter, but I'm trying to get into the habit of being a pantser so I'll get more done. 1. : The first piece of music I ever remember hearing was the Star Wars Overture by John Williams. 2. : My mother, sister and I moved to Richmond, VA, where I lived from 1988 - 1994. 3. : I was originally very much into acting, but went through a 5-year period of stage fright, only getting back on the stage to perform a sketch I had written. 4. : I am a film score lover at heart. I'm constantly collecting as many as possible and it does nothing but feed me creatively and emotionally.